Green energy looks so good until you look closely. What a waste! I wish smart meters would go away! And I’m not the only one. I don’t normally bother to read national print media. I find it is better for keeping the floor clean than anything else. But this is a cracker! I’ll admit that Audiophiles do give me some entertainment. But seriously how much time and money do these people have to burn? Crowdfunding yet again shows the power of paranoia and stupidity to relieve people of their money. Now I’ve got nothing against the general idea of crowdfunding. I’ve backed a few things and I’ve got some cool stuff to show for it. But you really need to pick through the stuff on sites like kickstarter very carefully. Especially after the potato salad thing. Oh dear oh dear oh dear… Firstly a quarter of a million bucks? I think he needs to look elsewhere for his tooling! Worst I’ve done is about 20k for a 4 action tool with a 5th manually removed block. Secondly does he know that CFLs can really overheat? It even states on the packaging that you can’t put them in enclosed light fittings! Even LED bulbs have the same warning. If you put a silicone cover over it the poor thing is either going to die in a few months or catch fire. He even puts one on an LED and covers the heatsink. Dude, what do you think the funky fins are for? Dead-bulb-tastic! Get a frosted GLS shaped LED bulb. 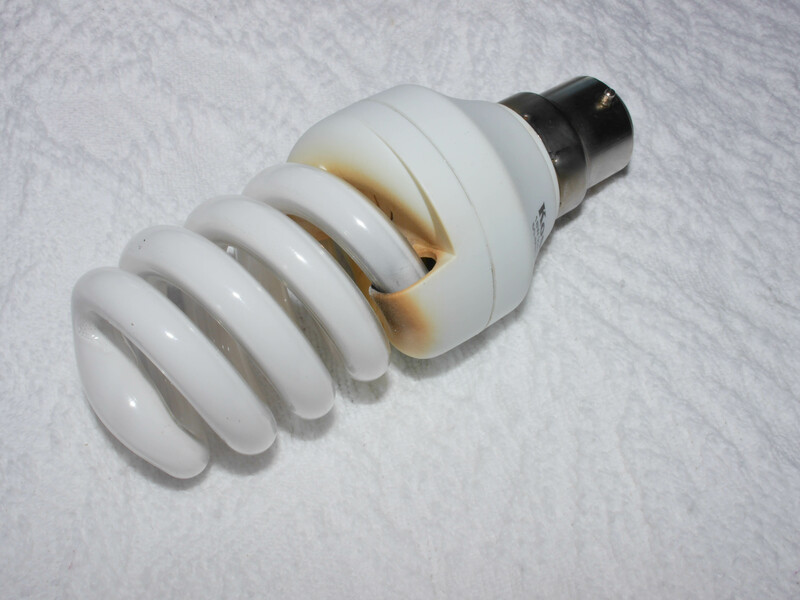 They are getting cheaper and you won’t need to risk inducing self immolation of those nasty CFLs or early death of your costly LED. Oh yeah, thirdly, Joseph Swan invented the light bulb 😉 Edison copied it. So EU regulations are now going to limit vacuum cleaners to 1600W and give them energy efficiency ratings. Not sure if this is a good move or not, but I can be sure it was a good waste of tax payer money dreaming it up. How about getting people to read the instructions rather than just going by advertising hype. Nothing to clog? Hmm, sure Mr Dyson! What about the filters you should be washing regularly and the amount of crud that gets stuck in the cyclones? No bad thing making the motors, impellers, air filtering etc.. more efficient. But now there is talk the EU is going to look at hair dryers, smart phones and kettles. Yes, kettles! Water needs a specific amount of energy to raise its temperature to boiling point. As energy is wattage x time (1 watt is 1 joule per second) so more wattage = less time, less wattage = more time. Hmm… so would a 1000W kettle save me 50% energy over a 2000W kettle? No! Oh… umm… darn! Actually a 1000W kettle would probably use slightly more energy as the longer heatup time would allow for more energy loss to the air. oops! So how do you save energy with a kettle? Boil just the amount you need, but we’ve all known that for years! Plus it has the added benefit of taking less time to make your morning cup of wake up. Most people will by now have a kettle with a newer type element and a plastic outer shell. Both of the real energy savers. Especially if you live in a hard water area! Death to kettles! As for hair dryers and smart phones… never use the former but again its heating something so will be similar to the kettle. And smart phones… I’ve tried to measure the standby current of their chargers but its below the resolution of my mains tester. Maybe less blindingly bright LEDs telling you its on would save some energy.